I never used to decorate the bedroom for Christmas. However, some years ago when my daughter was a freshman in college, I decided to surprise her when she came home for Christmas break by adding a little holiday cheer to her room. And since I didn’t want my other child to feel left out, I decorated her room as well. It didn’t take much to create a festive mood in their rooms. I bought them each a lighted tabletop tree which I color coordinated to their respective decors. I then decked the little trees with a few personalized ornaments–Disney princesses for one child and musical instruments for the other. I also festooned their mirrors with a single string of colored lights. That’s it. That was all I did. However, those small touches made such a huge impact. They were both so thrilled to have a little Christmas sparkle all to themselves, that it made me think that my husband and I might enjoy having some Christmas in our bedroom too. Since we are a couple of old fogies, we generally retire to our bedroom around 9-p.m. and then spend a couple of hours reading or watching TV before turning off the lights. Given this habit, we really appreciate that in going upstairs, we’re not leaving the cheer of our Christmas decorations behind. 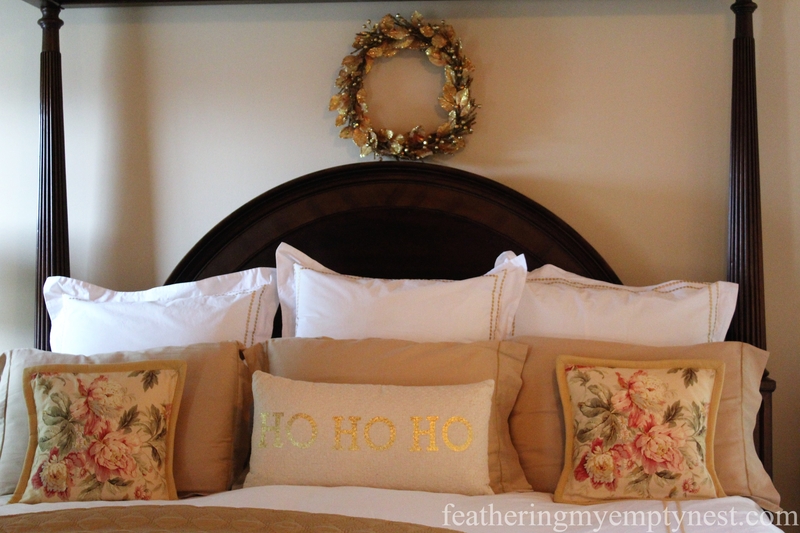 Gold and cream decorations create a serene but festive holiday mood in our merry master bedroom. 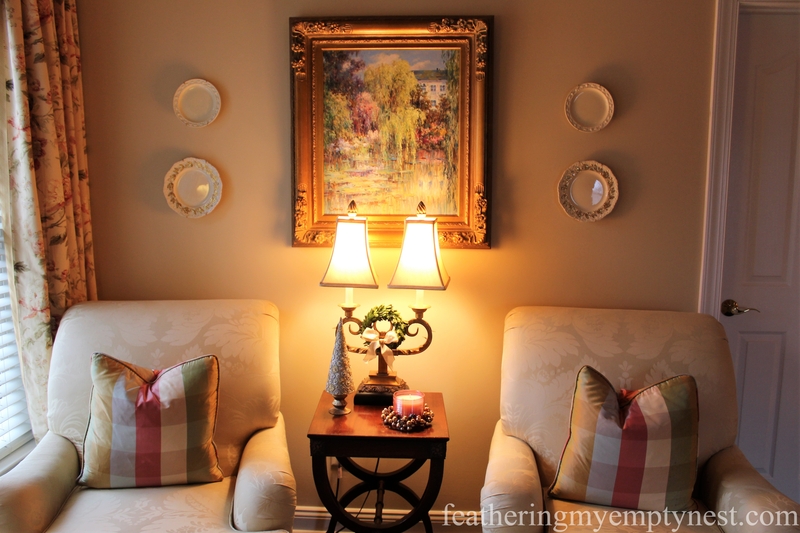 My first-floor decor is ideally suited to traditional red and green Christmas decoration. 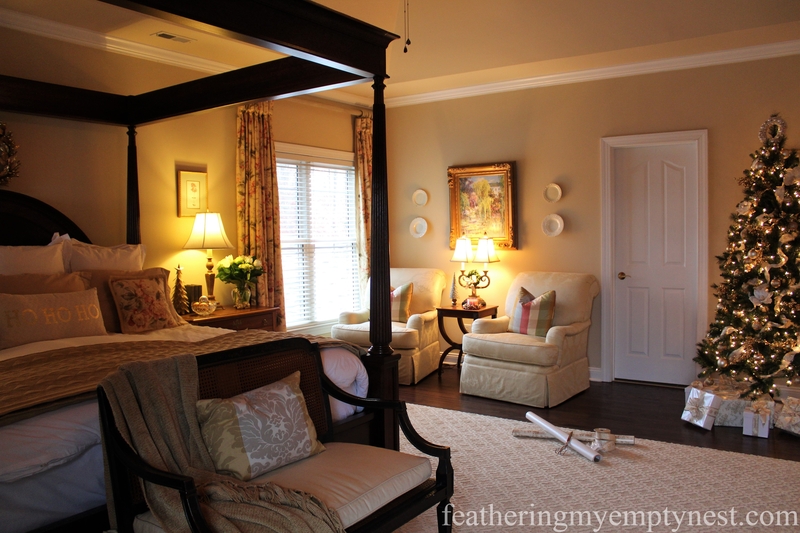 But I designed our bedroom in a more calming color scheme of cream and gold. 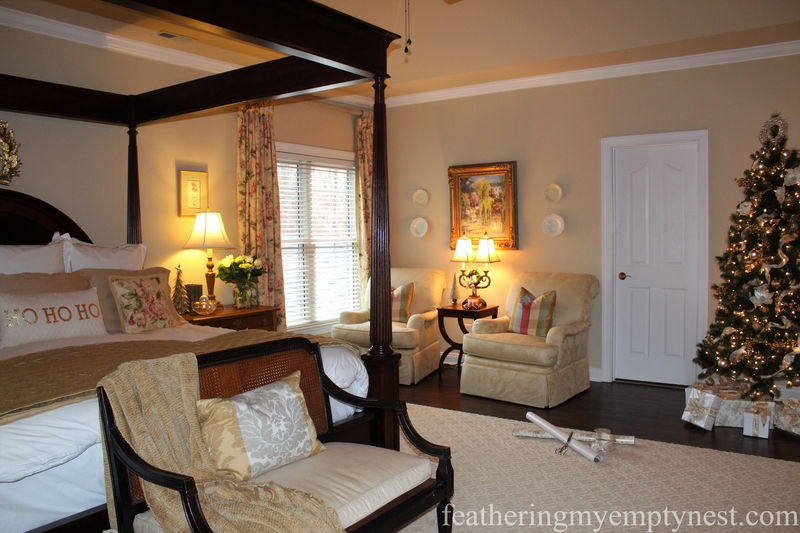 So, in decorating the master bedroom for Christmas, I kept to those colors. Initially, I didn’t do that much. 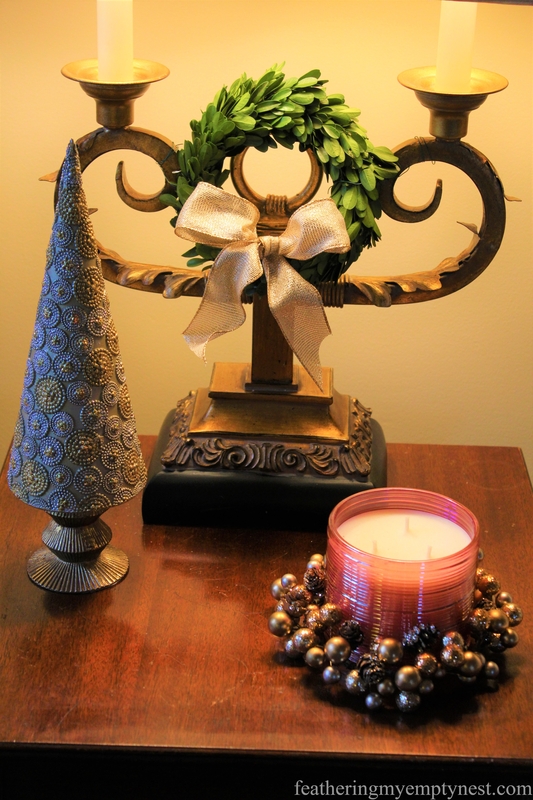 I hung a gold wreath above the bed and placed a few tabletop trees on the nightstands. My cheeky husband joked that he thinks it would be more appropriate for the bedroom if I flipped the holiday pillow so that the text was reversed. What am I going to do with him! 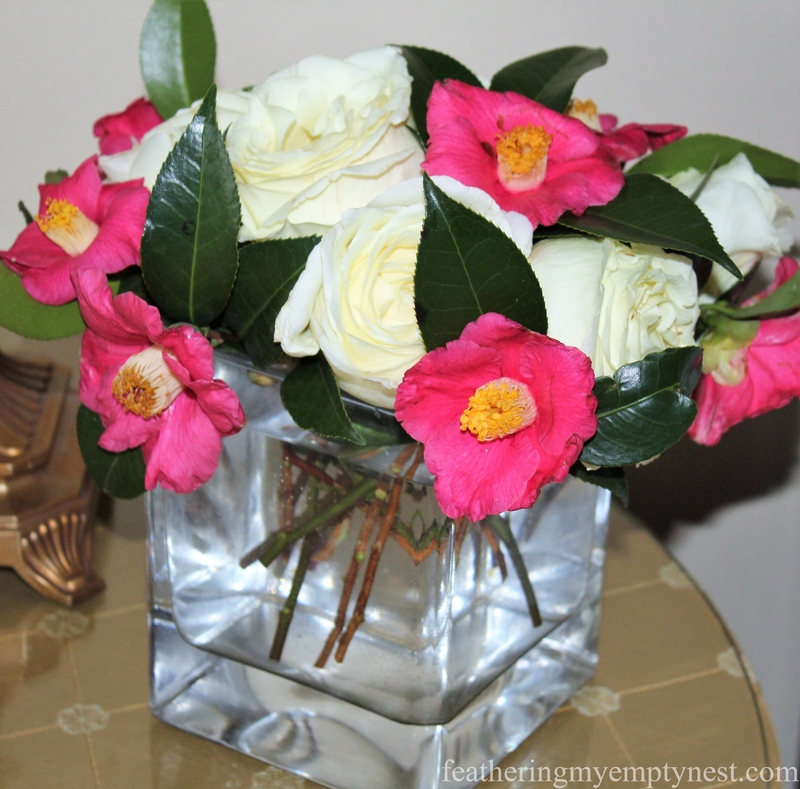 A simple arrangement of grocery store roses and deep pink Camellias cut from my yard add a pop of color to my bedside table. The antique desk that serves as my husband’s nightstand shimmers with gold ornaments, a wire tabletop tree, and a glittery reindeer. In the seating area, I topped the small table flanked by two clubs with yet another gold tree and a Christmas candle. 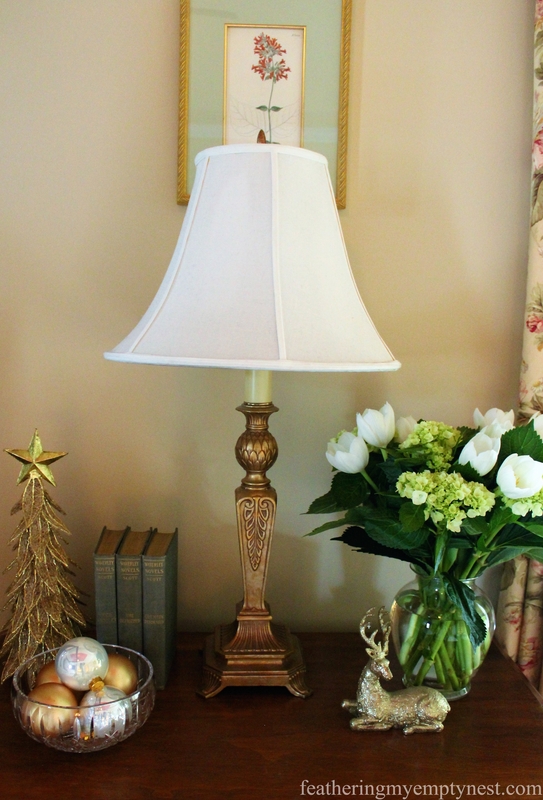 I wired a small preserved boxwood wreath to the lamp to add some greenery to the table. Because I can’t help myself, each year I add a few more decorations to the room. 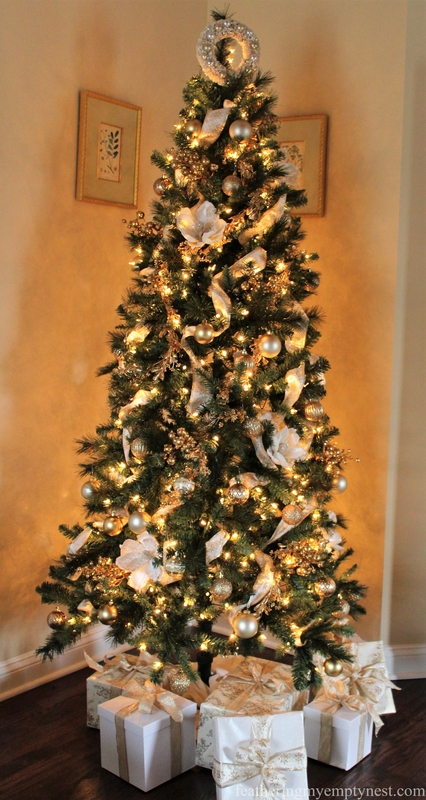 This year, I included a full-sized slim pre-lit tree which really amps up the holiday glow. 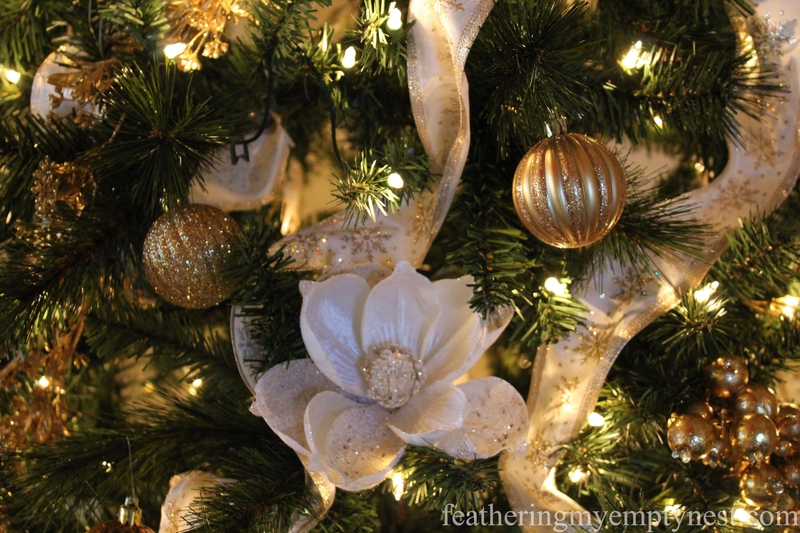 I decorated the 7-foot tree with cream and gold wired ribbon, gold garland, gold berry picks, white poinsettias, and gold and cream ornaments. 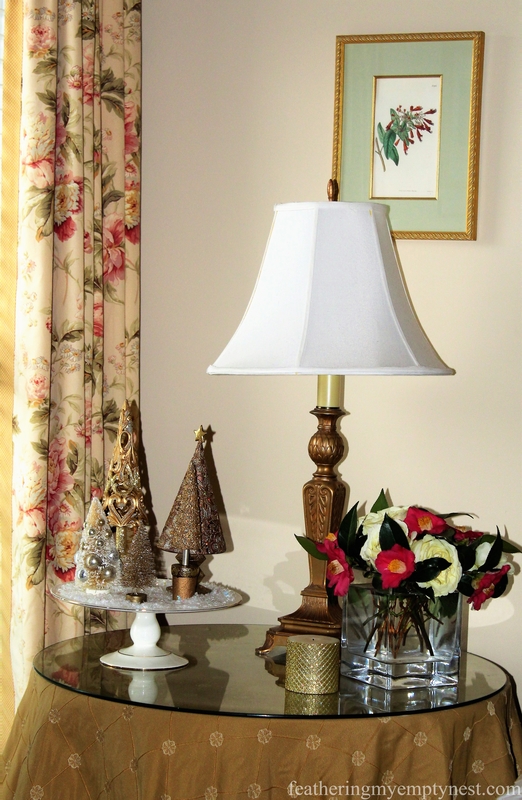 Some people may feel that it is not worth the effort to add seasonal decor to rooms that guests don’t see, but the joy we get from spending time in our Merry Master Bedroom makes decorating the bedroom for Christmas a wonderful holiday gift we give ourselves. Thank you so much for your kind comment. I wish you a very Merry Christmas! What a beautiful bedroom! 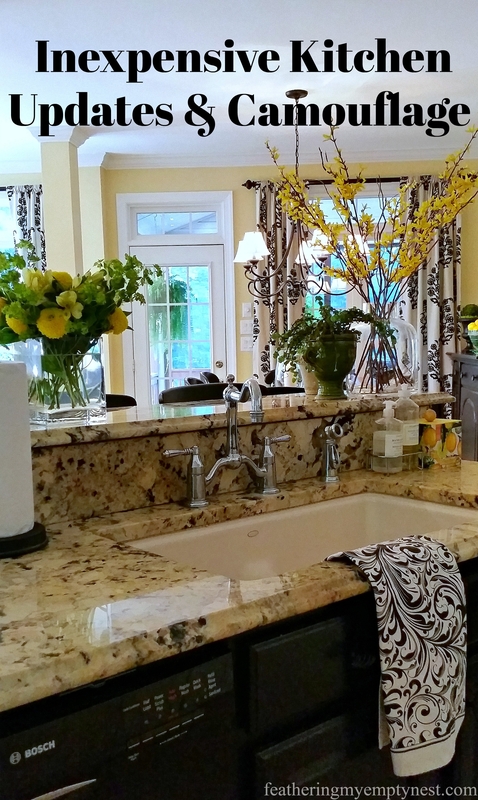 I love the idea of cream and gold. I have never decorated my bedroom, maybe I could add some Christmas cheer too. When my kids were younger I had a small tree for them. They would decorate as they pleased. Now they are off creating their own traditions. Thank you for sharing your cheer. Thank you for your kind comment. Your support means so much to me. 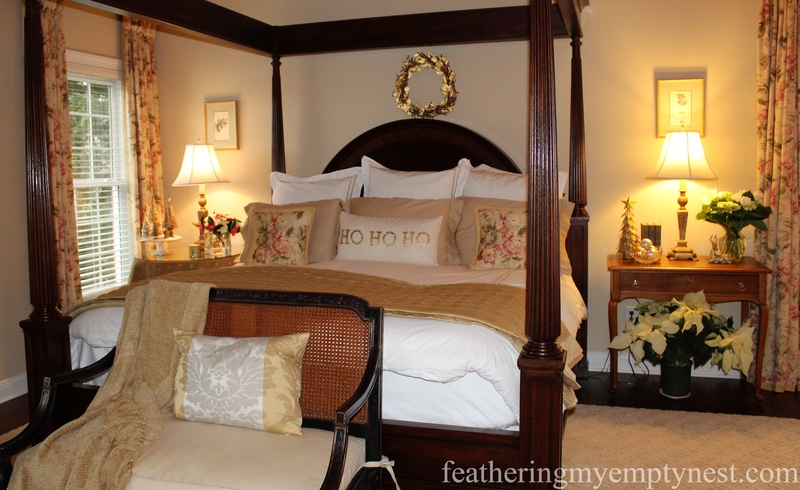 I hope my post has encouraged you to go ahead and add some Christmas cheer to your bedroom. These days, when everything on the news is so upsetting, we need all the cheer we can get! Thanks so much for your kind comment, Barb. Merry Christmas to you and yours as well! Thank you for your kind comment. As for having my husband write a guest post, I shudder to think what other “creative” suggestions he would come up with. You are toooo Much! It is beautiful.!! and I just put the halloween pumpkin in the trash. Actually fed it to the chickens! Thank you for your kind comment. I wish I had access to livestock I could feed my pumpkins to. I bought so many pumpkins this year that I still have some in my garage. I have been putting them in the garbage can a few at a time because they make the can too heavy. Hopefully, I will be able to get rid of all of them by New Years! How lovely. This year in particular I think we need as much holiday cheer as we can muster! Thanks so much. I couldn’t agree more. This bedroom is a haven! I could spend hours in there. I LOVE your furniture, accessories and style also. TFS. Thanks so much for your kind comment. I really appreciate it. I hope you have a happy holiday! Your tree is so lovely. I have a small white tree in my bedroom. I think it makes it so special to lay in bed and look at the tree. The bedroom is so pretty. Thank you so much for taking the time to comment. I really appreciate it. I agree with you that there is something special about having a Christmas tree in the bedroom. Have a very merry Christmas! Thank you so much for your kind comment. I really appreciate it. I wish you and yours Happy Holidays and a great New Year! It’s so lovely. I especially love the tree. I decorate every room of the house for Christmas. Thanks so much for your kind comment. I am with you. Christmas is such a special time. Why not celebrate all through the house! I love your bedroom and how you have it decorated for Christmas. Very simple and beautiful! Thanks so much for your kind comment, Carol I wish you and yours a very merry Christmas! Thank you so much for your kind comment. I hope you and yours have a very Merry Christmas! Beautiful! I don’t decorate my bedroom, but I think about doing it every year. Maybe next year! Right now I have empty boxes from the decorations in the bedroom. Too lazy to put them away! Thanks for taking the time to comment. I really appreciate it. I’ve got empty boxes from my decorations, plus unwrapped Christmas gifts all over the floor in my guest room. I will have to clean it up soon because my mother is staying with us over Christmas. Oh well, one thing at a time. Have a very Merry Christmas! Your bedroom turned out so pretty! The colors restful and serene. 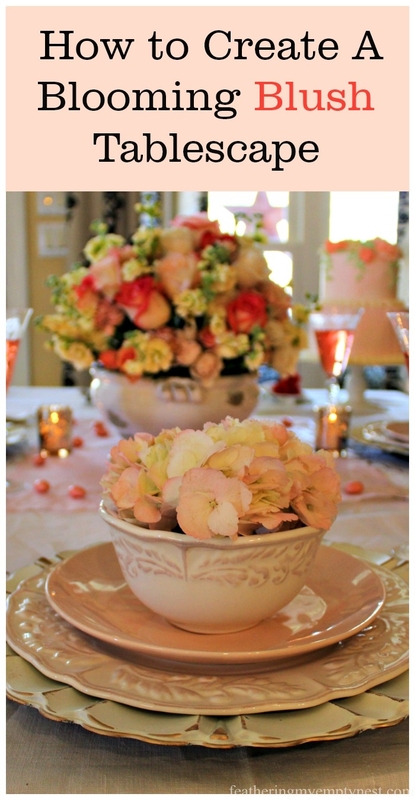 I love those little tabletop trees, especially the ones on the cake plate. Great ideas for adding a bit of Christmas to your daughter’s rooms too! Thank you so much for your kind comment. I really appreciate it. I wish you a very Happy New Year!